We keep saying how great it is to be here in the forest where there are no city lights…the stars are amazing. Next year, Brigette might start putting charts together for guests who want to head outdoors to see the constellations. Tonight, we checked out the exploding Comet Holmes with our binoculars. Very cool. It’s a fuzzy spot in the constellation Perseus. Recent measurements of the comet’s diameter say that it’s now bigger than our sun. 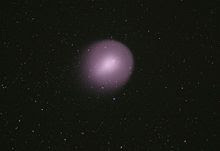 On Monday, the comet’s coma cloud of gas and dust will be close to Mirfak, the brightest star in Perseus, and you’ll be able to see Mirfak through the big ball of fuzz.